If boiled gnocchi wasn’t good enough, these little crispy balls are even better. They are so addicting that I might be eating this every day of the week. I can’t remember where I had something like this before, but I was so intrigued at eating gnocchi as a ‘side’ of something. Usually at restaurants, gnocchi takes the place of pasta in many dishes, served with the classic marinara sauce or some other cream based sauce. This recipe couldn’t be any simpler. Since I’m too lazy to make my own gnocchi by hand, which actually isn’t that complicated to make, I just bought some packaged gnocchi from Trader Joe’s. You can buy them from the pasta aisle or some are even frozen. Drop them into a pot of boiling salted water and let them heat up for a couple minutes. Gnocchi cooks really fast, like 3-4 minutes. You don’t want mushy gnocchi, trust me. In the meantime, start heating up your skillet with 2-3 tablespoons of good olive oil. Drain gnocchi and toss into the hot skillet, be careful the oil might splash you if you are too close. Let them brown for 1-2 minutes on each side, careful not to burn, and flip on the other side. 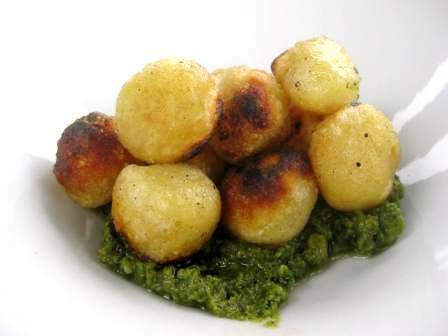 Before you know it, you have perfectly crispy gnocchi balls! Delicious served with a touch of sea salt or Parmesan or place on some homemade pesto. Enjoy! 3. Drain gnocchi and toss into skillet. Brown each side 1-2 minutes, be careful not to burn. 4. Top with sea salt, Parmesan, or pesto sauce.